A dating coach, writer, speaker and consistent giver of blessings dedicated to helping you get over your hurdles and under the chuppah. Not just I but we, your team of Marriage Minded Mentors, look forward to meeting you! 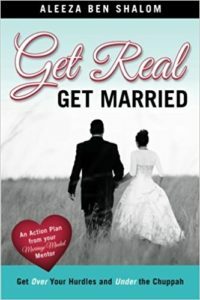 Perhaps you have a copy of Get Real, Get Married or you found one of our articles or videos online. However you found us, we’re so happy you’re here. We know you’re about to make the most important decision of your life and we’re here for you. With technology we coach clients all over the world. We love mentoring marriage minded singles and couples who desire their soulmate. To date, about 70 coaching clients are now married, a few are engaged and we hope to hear good news from more clients soon! On this site you can book a coaching appointment, sign up for an event or join our Mentor Academy (yes! we train coaches and matchmakers). Book a dating coach now!